While many people start their adoption process unsure of where, and how to proceed; Lisa and Harry had a unique perspective which led them specifically to Guatemala. After learning medical issues would prevent a safe pregnancy, the couple took a break from their jobs and traveled to South America for a three-month language and culture immersion program to take time to heal and process their choices. “We did not go to Guatemala with any expectation other than to take time off and learn a language,” says Lisa. “We discovered that we loved everything we experienced there: the food; the culture; the loving, warm and welcoming people who were so open to sharing. We knew by the time we returned to the United States that we wanted to adopt a child from this country which we held in such high regard”. Upon their return home, the couple immediately started researching and vetting adoption agencies with Guatemalan programs. Lisa, a social worker, immersed herself in articles and books about adoption to prepare herself for parenting an interracial adoptee, and started attending a support group to cope with the wait for their adoption referral. What Lisa couldn’t know is that around the same time she and her husband started their process, a baby girl had been born in Guatemala, placed in foster care at six months and was repeatedly rejected by prospective parents because she was not a newborn when she became available for referral. Lisa and Harry’s decision to remain open minded and flexible about the age of their baby essentially bumped them to the front of the line. “Our adoption process literally took less than a year from the time we decided to adopt, to the moment we had our daughter in our arms. We got our referral in July 2006 and six month later we were on our way to Guatemala”. The couple, in country for three weeks to complete the Guatemalan adoption process hoped to meet their daughter’s birth mother and eventually were told that she lived in a remote area, had missed the bus to the city and could not meet with them. Back in America with their daughter Myde in July 2007, Lisa and Harry began their lives as new parents. 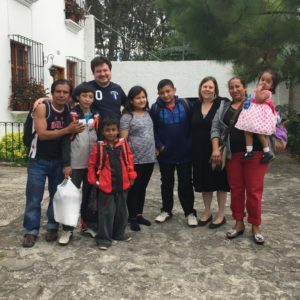 They kept in touch with their daughter’s foster family for eight months, as well as their Guatemala adoption attorney, to see if connection with Myde’s birth mother would be possible. “Unfortunately, over time it became apparent they were not the right people to help us,” says Lisa. Lisa continued to wonder about her daughter’s birth mother and recalls that Myde began to ask questions about her birth mother around age four. Lisa had spent time educating herself about adoptive parenting, and says she initiated age appropriate conversations with Myde from the moment they brought her home. Lisa explains that she quickly picked up on her daughter’s desperate need for connection. “Genealogical ghosts” a termed developed by renowned adoption researcher, distinguished professor and writer Hal Grotevandt, PhD, is very common challenge for adoptees. Without a point of reference, and saddled with DNA based personality and traits, adoptees can feel like a ‘puzzle with a missing piece’ throughout their lives and struggle with identity development. Several national longitudinal adoption research projects have determined that connection with birth families can alleviate anxiety and grief related to adopted individual’s loss of culture, history, and biological family and often result in closer connections with their adoptive families. “I will never forget the day I picked up Myde from daycare and she said to me, ‘When am I going to see my mom? When I am a grown up, or a kid?’. Myde would get visibly upset when she talked about her birth family and her concern and strong emotions were palpable. As soon as my daughter talked to me in such a direct and emotive way about her concern, I was prompted to get back on track with our search for her birth family” reports Lisa. In the meantime, Lisa initiated conversations about Myde’s culture and biological family using an adoption Lifebook she had created for her daughter. The book included photos of the family’s trip to Guatemala to adopt Myde, as well as pictures of her daughter’s foster mother; and was an important tool that helped Myde develop awareness of the importance of her foster mother. Lisa and Harry began to realize that locating competent international search professionals is difficult. The family had terminated their agreement with their first search organization, then hired a highly regarded professional searcher who could not locate Myde’s birth mother. When Myde turned eight, Lisa and Harry made a third attempt to help their daughter reunion with her birth family. “They immediately told us that there was no way they could pursue a search because there was no new information about Myde’s birth mother in the government files, and refused to accept money for work they could not perform. However, they also told us that Guatemala was just starting to digitize government data so it was possible at some point Myde’s birth mother’s information would be available. We were disappointed, but we appreciated how ethical they were and decided to put the search aside”. However, the impossible soon became possible. The third professional searcher’s tenacity and attention to the case paid off; soon after Myde’s eighth birthday Lisa says the Guatemalan birth family search organization discovered that Myde’s birthmother’s national ID had been digitized. Lisa and Harry learned that the search for Myde’s birth mother was stalled because she was not living at the address listed in the national registry. However, the searcher continued to wander around the area, talking to people in the neighborhood. In a moment of total serendipity, the searcher met a woman she soon realized was Myde’s step-grandmother. Even more amazing, the searcher had been a childhood acquaintance of Myde’s birth mother. Lisa says she was initially stunned by the news that her daughter’s birth mother had been located after so many failed starts. “Myde had always worried that her birth parents had been sick and afraid that they were dead,” Lisa states. “Of course, she went through some ups and downs about whether she wanted to meet her birth mother, but she latched onto the pictures of her biological brothers immediately and definitely wanted to meet them. We printed photos of her brothers, and she keeps them in her room, and constantly moves them around so we know she looks at them often. After initial contact with Myde’s birth mother, Lisa and Harry sourced a birth family connection facilitation organization called Familias de Corazon and began exchanging letters and pictures three times a year. While preparing for the reunion the Lisa and Harry found an adoption competent therapist for their daughter to help Myde process and cope with the idea of meeting her birth family for the first time. Lisa and Harry also started meeting with Joni Mantell to prepare for the reality of reunion, discuss expectations and process ideas on how to cope with the unexpected reality of most reunions. The family was ready to travel to Guatemala in January 2017, and Myde grew more excited as the reunion date approached. Meantime, in Guatemala, Familias de Corazon and the search facilitator located a translator for the family, made in-country travel arrangements, arranged for a reunion location in Guatemala, and assisted the family locate a rental home near the site. The family was encouraged to limit the first reunion to a one day encounter to minimize anxiety for everyone. “In retrospect, I feel that she was very right about that,” Lisa explains. The family flew to Guatemala in January 2017, and after a few days visiting tourist sites and enjoying Guatemalan culture, Harry, Lisa and their daughter waited at prearranged site to meet Myde’s birth family. “I was standing near the entrance of the site looking through the glass of the front door when I noticed Myde’s birth mother slowly approaching the building entrance. She had brought along Myde’s biological 15, 13 and nine-year old brothers, plus her two-year old daughter from her second marriage, and her second husband. Lisa and Harry later learned that Myde’s oldest brother could not attend the reunion because he feared missing a day of work would result in losing his job. “At first, Myde did not want to come outside and meet her birth family, and told me that she was too scared. So, I went out first and said hello to them. Myde’s birth mom started to cry, and that set me off. Suddenly, Myde appeared behind me, peeked around me, then walked to her birth mother and embraced her. The translator did a fantastic job translating the words and cultural nuances to us, and I am glad we videoed the experience because we were all too emotional to remember exactly what each of us said or did, Lisa recalls. Interestingly, Lisa and Harry feel that meeting her birth mother was important to their daughter but Myde seems most interested in her connection to her biological siblings. “She adored time with her brothers and little sister. They all gave Myde the longest hugs, and all spoke to her. While she hesitated to meet her birth mother, she ran right to her siblings. She was thrilled and had the biggest smiles for her brothers. She played with them all day, swimming in the pool and playing soccer. “Because Myde is an only child I sense that she feels very alone at times,” comments Lisa. “In Guatemala, she suddenly acquired four fun siblings she related to and played with despite the language barrier. It was amazing to see how happy they all were to be together. I feel like Myde’s connection with her entire birth family really completed the picture for her. “What really strikes me is that the night before we met Myde’s birth family the three of us were wandering around the streets and suddenly Myde burst into tears and said, ‘I don’t fit in anywhere because I don’t speak or understand Spanish’. It was such a profound statement because here we were in Guatemala, and yet Myde felt disconnected due to her status as an American. It was significant that she could verbalize that she does not really fit in either place. Even though we initiate adoption conversations, and are very open and honest about adoption in our family, she will always feel a loss associated with the loss of her birth culture and birth family. At the same time, Myde came back from our reunion trip with a much stronger Guatemalan identity. She has a Guatemalan soccer shirt that she won’t take off and I can tell that she is becoming more comfortable with that part of her identity. Lisa shares that after the initial encounter, Myde ran off with her siblings to play and she had some mom-to-mom time with Myde’s birth mother. “Myde’s birth mother asked me all kinds of typical mom questions: Does Myde do her homework? Does she have good friends? It was nice to share that sort of mom to mom piece and it was a wonderful day. Myde was very sad when her birth family had to leave for their long journey home which is to be expected. But she bounced back emotionally and I was pleasantly surprised, and continue be amazed that Myde has not asked about going back to see her birth family. I wonder if somehow just seeing them that one time was enough for her. We will go back someday, but I think her desperate need to see them has been met. The most important thing to me is that my daughter said to me after the long first day of our reunion journey, ‘you know my mom really does love me, I know that now’. “For her to make that connection at her age is amazing, and I am glad that we did the search when she was young. We know that identity formation is an integral part of adolescence and more complicated for adoptees. I am happy we did the search and reunion before Myde reaches her teen years,” Lisa affirms. “We are now five months into our reunion and I would say that at times Myde is interested in her birth family, and at other times she is disinterested. Sometimes she says, ‘mom lets write a letter’, other times she tells me she does not want to. Then weeks will pass and she wants to write a letter together to her birth mother. One thing that is consistent is that she has always been interested in, and asking about, taking a trip to Guatemala again someday. “Myde also has integrated her siblings into her life in a very interesting way. When Myde and I go to playdates for the first time, moms will comment that I must have a very busy home with so many children in the house,” Lisa laughs. “She is open to sharing she has siblings, but I feel is still processing her thoughts about her birth mother. Lisa emphasizes that support was an important piece of their reunion experience. “Finding adoption competent therapists and support is essential when you are going through the adoption process,” adds Lisa. “I have found that very few people really understand the unique and complicated adoption process, both prior to and after an adoption referral”. IAC Center Adoption Talking Circle– Our Talking Circle is a place for all adoption constellation members to talk about adoption and to hear the perspectives of other people that are in also trying to navigate complex adoption relationships and improve their self-understanding. The Talking Circle is a place to share, learn and enjoy a sense of community; and will be especially beneficial to those considering or involved in Search and Reunion. Date: Date: On the 4th Friday of each month: June 23, July 22, August 25, etc. REGISTRATION Required so we know the number of people to expect. There is no required fee. Donations are accepted.